Have you ever had an idea so crazy that you thought it might just work? As I searched for a Champions League Final ticket and was quoted prices between £800 and £3000, I began to think of alternative ways I could get inside the stadium. After contemplating how much I could get for one of my kidneys or whether any of my female friends would consider being sold to an Arabian prince (definitely Clare, if you were wondering), I had a flash of inspiration. Aside from the fans, who else would be in a football stadium? 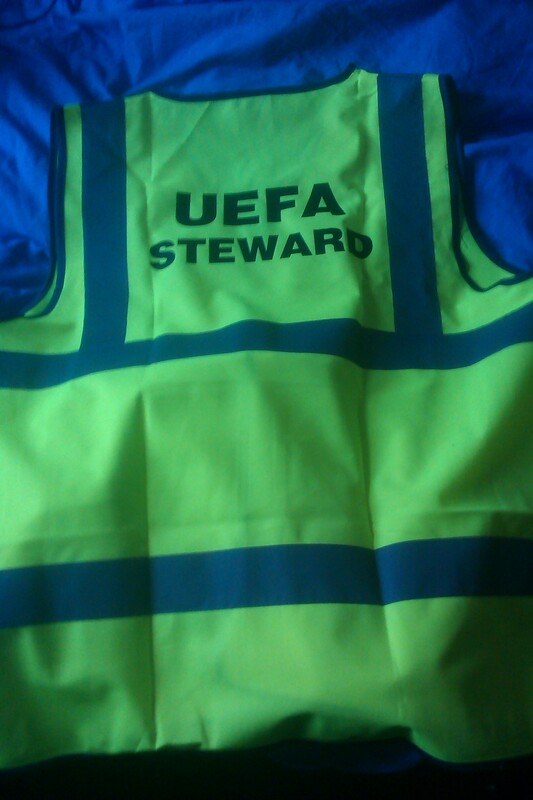 The players themselves of course, and hundreds, if not thousands, of fluorescent jacket wearing stewards. To avoid giving the game away I decided not to reveal the plan on any form of social media before the game, but I did bring the jacket in to work to demonstrate my masterplan. Opinions varied from “It’s definitely going to work that” to “you’re going to get arrested”, with both sides of the argument having very valid points. Still, there was no going back from here, with my continued search for an actual ticket continuing to return options more expensive than my house. I headed down to London early on the day of the final, partly to try and find a tout looking to get rid of a ticket, and partly so if I did get arrested, my last hours of freedom were spend surrounded by drunken Germans. 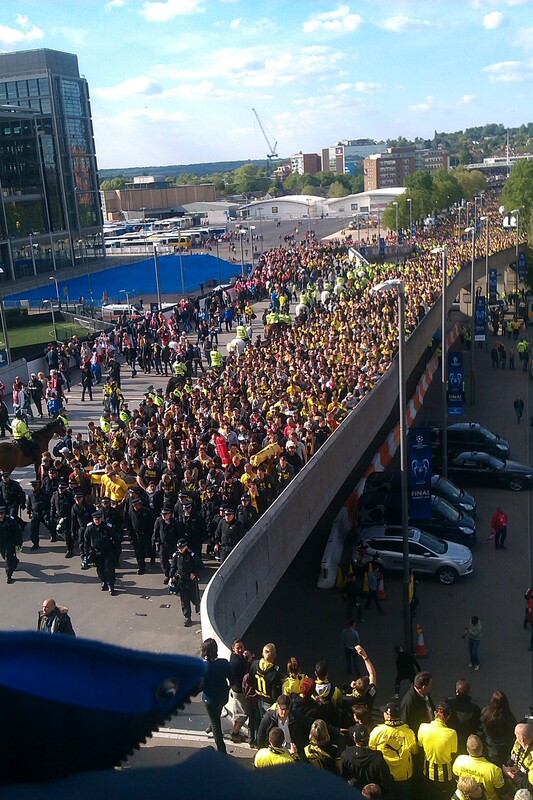 London had been turned yellow and black, with Dortmund supporters as far as the eye could see anywhere you turned. 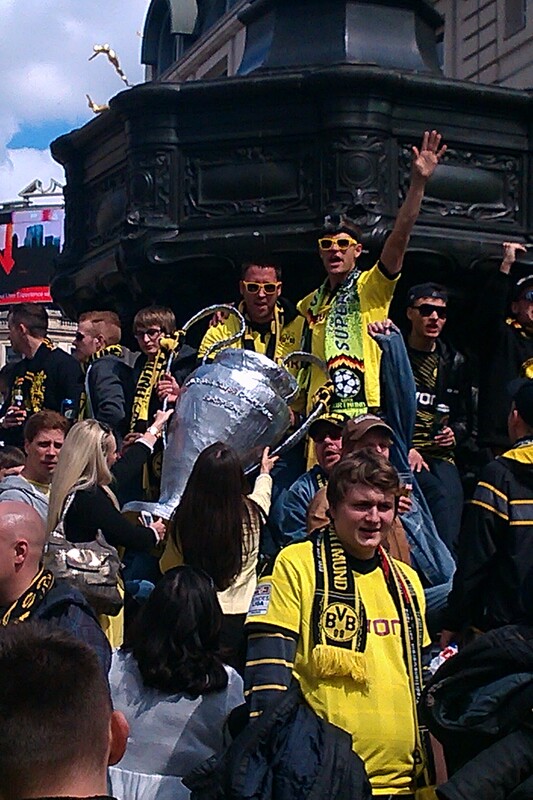 I ended up taking in the pre-match atmosphere at Piccadilly Circus, with BVB fans covering the Statue of Eros, including one supporter who managed to climb to the very top and drape a Dortmund scarf over the bow and arrow, all without spilling a drop of his beer. These fans had not seen their team at this stage of the Champions League since 1997, and it was clear they were here to enjoy every moment. As well as the singing, quite a few of them looked like they had been drinking since 1997. With the nerves kicking in about my genius/incredibly stupid plan, I decided to go in to the Tesco’s near the station to join the yellow and blacks with a couple of beers. Unfortunately, half the population of Dortmund had also had this idea, with the manager forced to announce: “We apologise for the lack of beer and spirits. This is due to Germans drinking them all”, which instantly became my favourite supermarket announcement of all time. After enjoying a few hours of build up, it was show time. 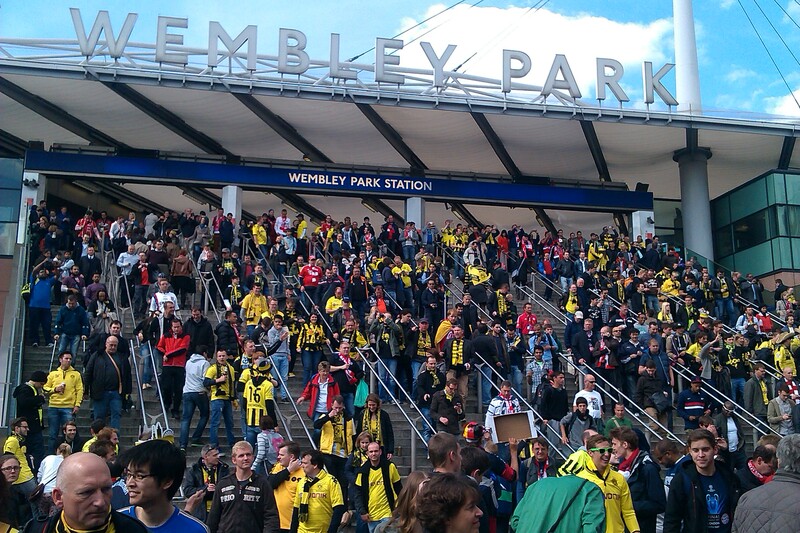 I caught the train to Wembley Stadium, and once again the Dortmund fans heavily outnumbered their Bayern counterparts. This can probably be attributed to the numerous recent final defeats suffered by the visitors from Munich, who presumably still have Didier Drogba on their dartboards. A quick check with the touts (“£2,000 mate, good view though”) confirmed that there was no way I was getting in to the stadium legitimately. £3 jacket from eBay donned, it was off down Wembley Way. The fact that a couple of people asked me questions about the stadium added to my confidence about the plan, which I was starting to dream could actually work. I had half expected people to point and laugh at the moron in the homemade jacket, but it was at least convincing enough to fool heavily intoxicated football fans. I found an entrance which appeared to be in use by stewards, VIP guests and performers, choosing this as my planned route. 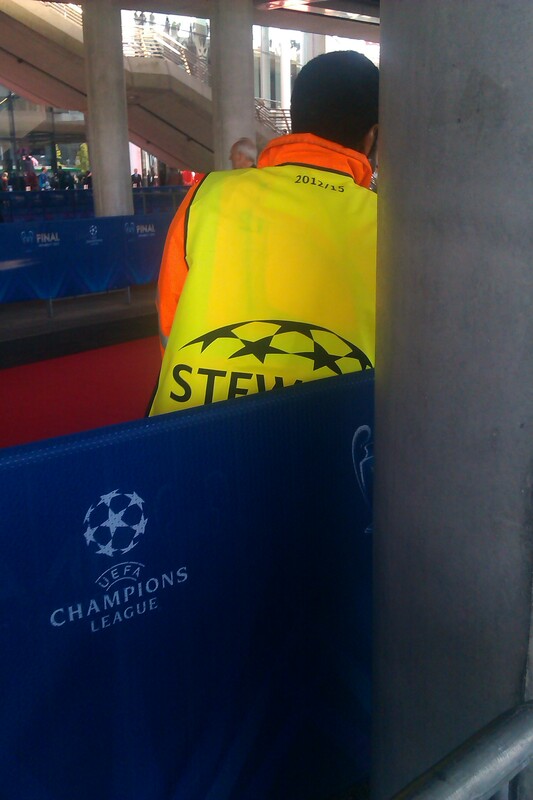 I hung around this area for a while, nodding at various important looking people as they strolled into the stadium, including the officials from Bayern Munich. As the number of people in suits began to dwindle, it was time to make my move. As casually as I could, I wandered up the red carpet and through the entrance to the stadium. Just as I was about to congratulate myself on being the sneakiest genius of all time, I was asked to show a pass. After ‘looking’ for it in my pocket, I announced that I must have left in the car. When I asked if she wanted me to go back and get it, she told me that I must have had it to pick up my uniform. At this stage I realised I was probably just minutes away from having rather large security guards jumping up and down on my head, and decided it was time to fall back. 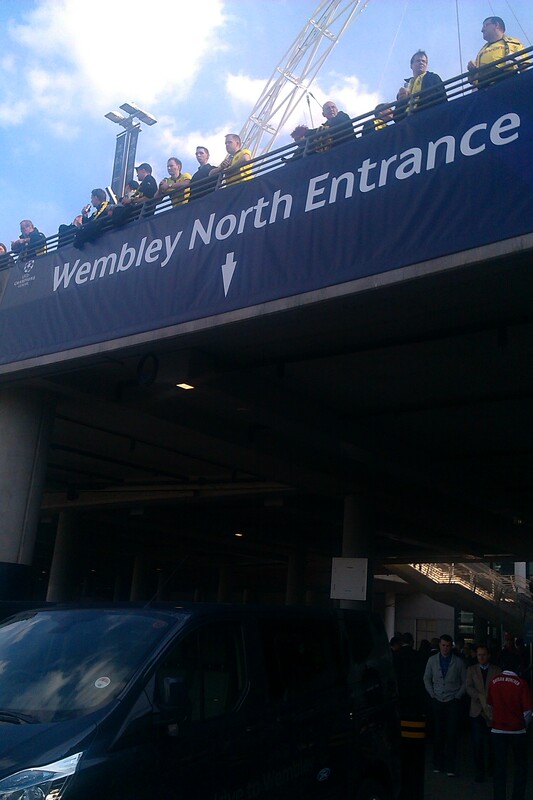 “I’ll be back now!”, I said over my shoulder, as a hasty retreat was made back to the crowds of Wembley Way. Tom Cruise never ended one of the Mission Impossible films by running away and going to the pub, but this was the outcome of Operation Wembley. Thousands of ticketless fans from both sides were watching the game in the bars around London, meaning I was still able to witness a tremendous atmosphere and didn’t get arrested. What more can you ask from a day out? 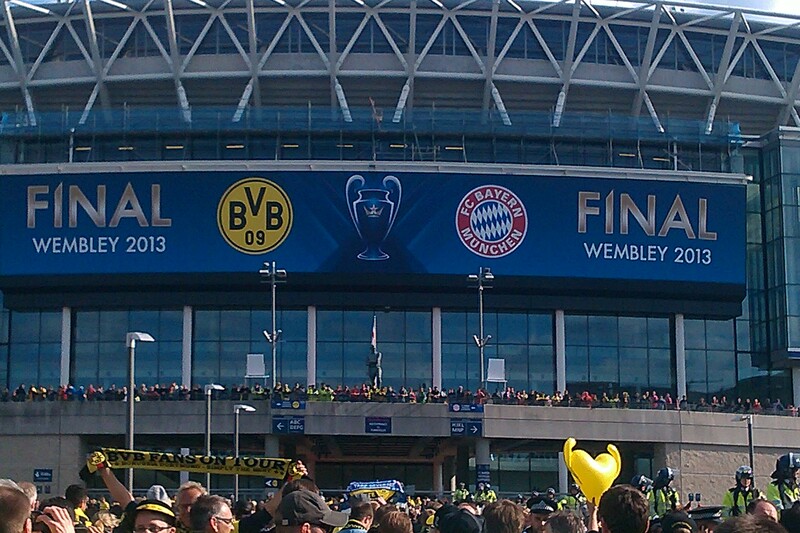 Wembley. I came, I saw, I ran away and got drunk instead. Posted on May 26, 2013, in General. Bookmark the permalink. 20 Comments. Fair play, this was a brilliant read. I was definitely bracing myself for an abusive comment here, thanks! Yesterday very much falls into the category of ‘worth a go’. Hilarious! Thanks for sharing this. Tom Cruise would be proud of the effort. Good effort. Maybe if you have another go in the future, try making a ‘Health and Safety Officer’, pass. Rest of the blog is good as well. LOL. Much respect dude. Sounds like a brilliant day out, and a hilarious story to tell the grandchildren one day. 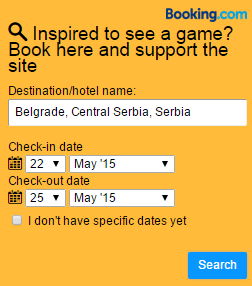 Just apply in the UEFA Public ballot next time. It is much easier I can tell you. I have been to 5 Finals now…..
I’ve applied a couple of times and never got one, you must be luckier than me! I love this stuff. You’re living life right there. You tried and had an exciting day. I’m sure you’ll get to watch a final sometime. I LOVED reading this, Thank You. :). You really are the biggest numptie I’ve ever known in my life. An entertaining one though. God bless you, Dudds. Very impressive I must say, just read it to my brother and we both doff our caps! One of my favourite football posts ever, I still come back to read it and laugh! It really deserves to be seen by all football fans, absolutely brilliant stuff. Me and a few mates once got into an England away match by flashing our laminated England Official Supporters’ Club card at the press entrance. Even went to the post-match press conference.